Wrap wreath form in jute twine. Paint dowel gold and cut out foam board pieces to make the arrow tip and end pieces (I have no idea what they are called!) Paint them gold as well. Once the paint is dry, poke the dowel through the wreath on an angle, and then glue the tip and end pieces onto the dowel. Touch up with gold paint if necessary. Snap the stand off the frame and glue the frame onto the wreath with hot glue. Keep in mind that hot glue will melt in the sun, souse a more stable gluing method if you want your wreath to stay up more than a day. I am just using mine for the party, so it will be fine. And there you have it! 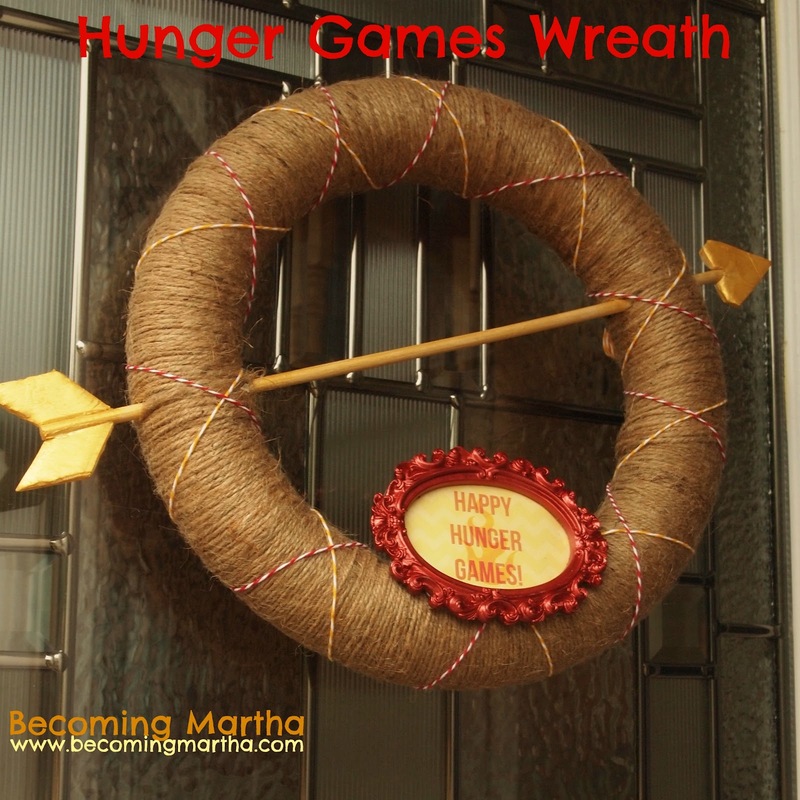 A cute Huger Games wreath – or if you like, change the colors up and you have a cute Valentine’s Day wreath! Here’s the Happy Hunger Games image that I created for the wreath. Feel free to download it for personal use. Click on it, then right click to save as. Love, love, love!! It’s perfect! That frame is adorable! It is so awesome! I love the Happy Hunger Games sign on it.